We got this rocking chair from Nate's mom a few years ago and have moved it around with us ever since. The blue cushions that we picked up very quickly for it weren't super comfortable and so it didn't get a lot of use but Nate loves it so we continue to move it around trying to find a home for it. (Technically speaking, Nate moves it around since it is a very solid piece that is too heavy for me to even kinda pick up). We finally decided that the guest room would be a great spot for it to hang out, but to do that, it needed a little makeover. I found these really soft and comfortable cushions in the cheap inexpensive "off to college" home section of Kohl's and Nate hit the chair with a couple of layers of spray paint. All of the sudden, totally different looking chair! The cushions make a big difference. We actually sit in this chair now and it is quite cozy! 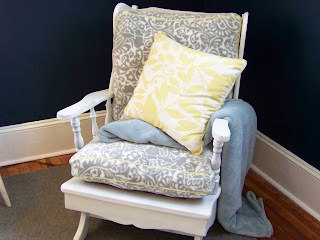 great job on the rocking chair makeover! I love what a little spray paint can do to something! This turned out great! 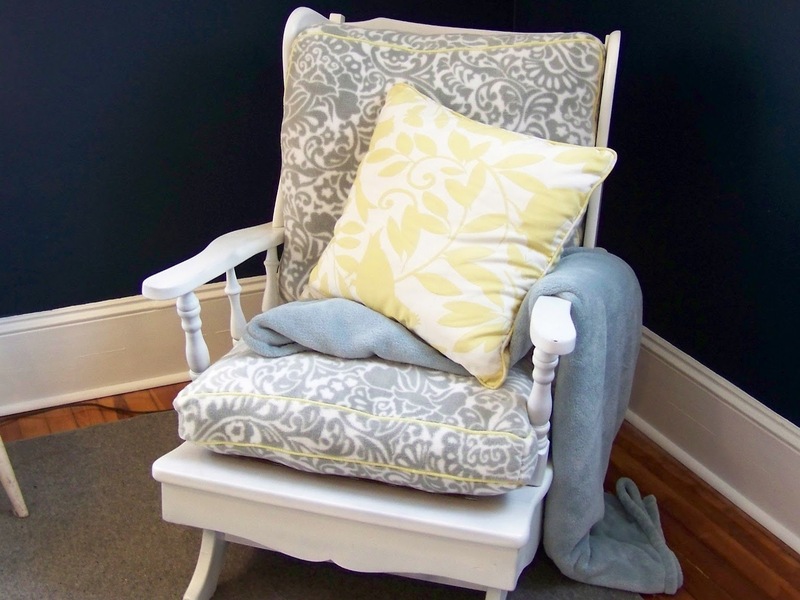 I actually have a wooden rocking chair in our nursery and I've been thinking about picking up some cushions. Looks like I'd better check out Kohls.